About our company by Childrens Party Entertainment Ltd.
Children's Party Entertainment Ltd who are based in Fareham, near Portsmouth in Hampshire, is one of the leading children's entertainment companies in the UK. Supplying top quality, professional children's entertainment for every occasion, from private Birthday parties in a hall or at home, to providing performers on luxury cruise liners worldwide. The company was set up in 1994 by some of the UK's foremost children's entertainers for two main reasons. Firstly while the entertainers were out busy performing they realised that they were unable to answer calls regarding bookings and enquiries so people often had to wait for a reply and secondly they wanted to raise the standards of children's entertainment by making sure all the entertainers used by the company were thoroughly qualified and proficient in their chosen fields. So it was decided that they would set up an office, which would open from Monday to Friday from 9 am to 5 pm, to enable customers to speak to a real person rather than an answering machine and get help with their enquiries instantly. This also meant that the entertainers could still be out performing and the office staff could take their bookings for them. The aim was to make sure that all the staff employed in the office were experienced in one-way or another in the children's entertainment industry. 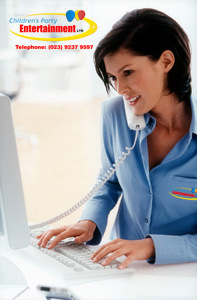 This meant that they could give advice and help book the best entertainer that most suited the customer's requirements. These arrangements proved a great success for both the entertainers and the clients alike. Customers were able to get instant replies to their enquiries and the entertainers were out doing what they do best - entertaining children. Very soon through demand, the company needed to expand, but they didn't just want to fill their books with any substandard entertainers as the company now had a great reputation to uphold. So it was decided that they needed to raise the standard of children's entertainment in general by forming a group of the most popular, reliable and sort after children's entertainers on the circuit. These entertainers were thoroughly police checked deeming them safe and fit to work with children. This system also proved to work well when a particular entertainer was asked for on a certain date but wasn't available. They could then confidently recommend one of the other team members who they knew were of the same high standard as themselves. So the customer didn't have to look elsewhere trawling through the yellow pages or searching the Internet not knowing who they would end up with and if they had all the relevant safety checks that our entertainers hold. Also, if we have regular bookings at a school or venue, we can send out different entertainers each time so that the children never see the same act twice. A service that solo entertainers cannot offer. Another huge advantage we can offer our customers that solo entertainers cannot is (heaven forbid), in the unlikely event of an entertainer being ill or in the case of a vehicle break down on the day, we always have covered so you won't be left high and dry. We know this happens because we often have last minute calls from terrified parents in a panic who have booked other entertainers and have been let down at the last minute. Children's Party Entertainment has become very well respected in the industry and now has many of the south's leading children's entertainers on their books. These entertainer's individual accolades include being multi award-winning and they have performed for the children of royalty and many top celebrities. They have also appeared at many prestigious events and venues on luxury cruise liners such as The Oriana, Aurora, Oceana, Azura, and the Ventura. They have also worked on many television channels such as The Disney Channel, BBC TV, Sky Television and ITV to name but a few. Our children's entertainers are also proud members of such well-respected organisations as the world famous London Magic Circle, Clowns International, British Equity & the Variety Artistes Federation and the International Brotherhood of Magicians. We also ask that all of our hand-picked exclusive entertainers hold the following for our customer's safety and peace of mind. An enhanced DBS certificate. (Criminal records bureau Police check) Proving that they are deemed safe and fit to work with children. That they have all their electrical equipment PAT tested for our customer's safety annually. Magicians, Clowns, Wizards, Pirates, Cowboys, Puppeteers, Face Painters, Jugglers, Junior & Teenage Discos, Walkabout & Mix and Mingle artistes, Stilt Walkers and many more. Covering: Hampshire, Sussex, Surrey, Berkshire, Wiltshire, Dorset and beyond. When it comes to your children, always book the professionals.